acknowledge breaches of human rights experienced by Aboriginal and Torres Strait Islander people. Access the histories online, or download a printable version. We have produced a calendar of dates and observances that are important to Aboriginal and Torres Strait Islander peoples. The Commission recognises and respects the unique cultural heritage of Queensland's Aboriginal and Torres Strait Islander peoples and their special relationship with the land and sea. 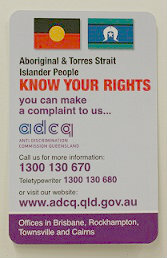 The Know your Rights card for Aboriginal and Torres Strait Islander peoples briefly outlines your right to fair treatment under the Anti-Discrimination Act 1991 . It is credit card size and made of tough laminated material. Tracking Your Rights was originally produced as part of the National Aboriginal and Torres Strait Islander Community Education Project. The aim was to assist Aboriginal and Torres Strait Islander people to use anti-discrimination laws to bring about improvements in social justice for community members.The Queensland version is a social justice package to inform Indigenous Queenslanders about their rights and is currently being updated, with all the latest information. Generally, it is unlawful discrimination to limit a work opportunity to a person of a particular race. However, the law recognises that there are some groups in society who are affected by past or continuing disadvantage. Aboriginal and Torres Strait Islander peoples are one such group. Reaching out to Aboriginal and Torres Strait Islander peoples everywhere in Queensland is a full colour poster 23 cm x 44.5 cm featuring a painting by Aboriginal artist Colleen Wall titled 'Walking Together for our Future'. This booklet includes questions and answers about refugees, migrants and Indigenous people and is available from the Human Rights and Equal Opportunity Commission website. Aboriginal and Torres Strait Islander material and information accessed on this site may be culturally-sensitive to some individuals and communities. The words 'Aboriginal and Torres Strait Islander', 'First Nations', and 'Indigenous' are used interchangeably on this website to refer to the Aboriginal peoples and Torres Strait Islander peoples of Australia. We understand that some Aboriginal peoples and Torres Strait Islander peoples are not comfortable with some of these words. Only respect is meant when these words are used.